Steampunk Wedding Dress from WeddingDressFantasy. The base layer is made with high end Champagne Bridal Satin. The overlay is made with a soft sheer pleated Champagne Organza that will make you want to dance the night away. 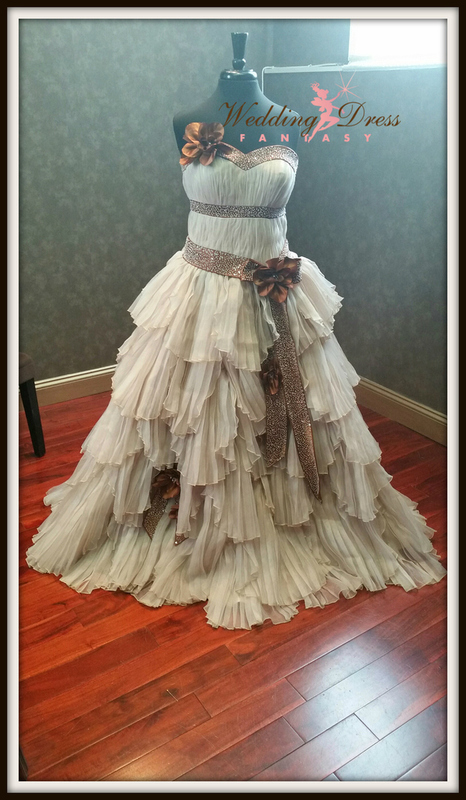 Bronze colored Satin bands and flowers adorn this amazing gown. Last picture shows optional gears and sprockets that can be added for an additional $100. Comes standard with a zipper back. Shown with a corset back (which is an additional $75). This gown can be customized for an additional fee. Please contact us first if you want to make any changes.